Before I plug jack 3.5mm the player has no problem. After that I relaunch Poweramp (with aux 3.5mm connected or not) and it work fine until I un/plug them. When you plug in the headphones the output plugin might change. 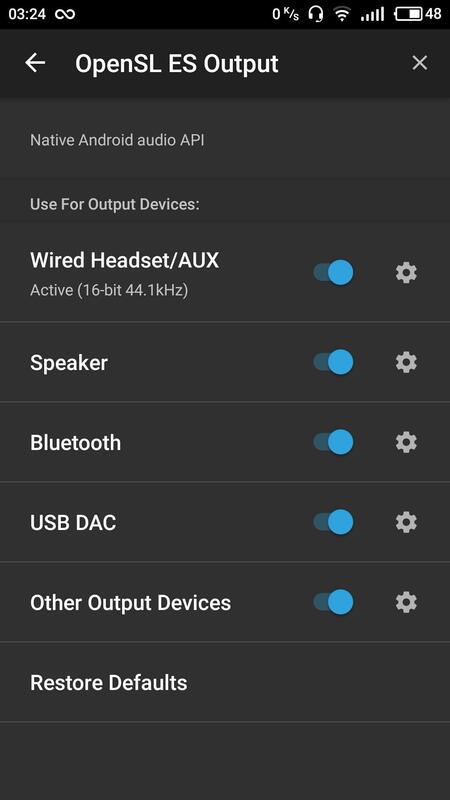 Check in Settings > Audio > Output and make sure that it stays the same across output devices. Perhaps the screen recorder requires java audiotrack output ? Hello thank's for the reply I'm back sorry to answer you so late. 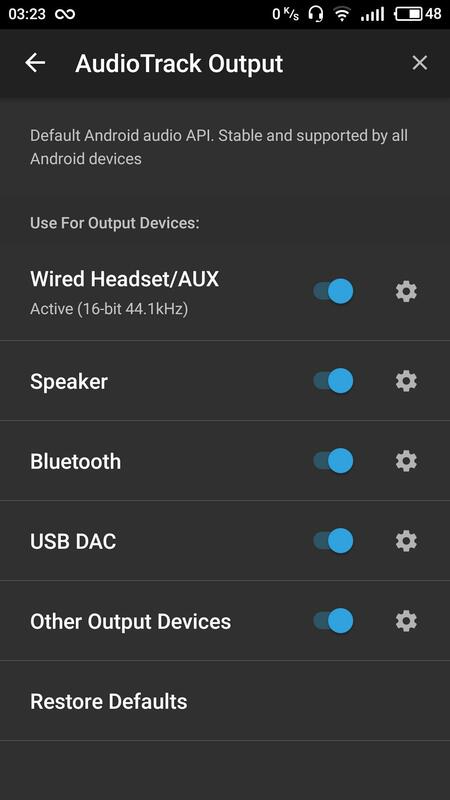 My screen recorder does not have the functionality of capturing audio. It's include in the official Meizu ROM. By default my Poweramp is set to AudioTrack Output here some pictures. Even when I'm using OpenSL ES Output the error still here. 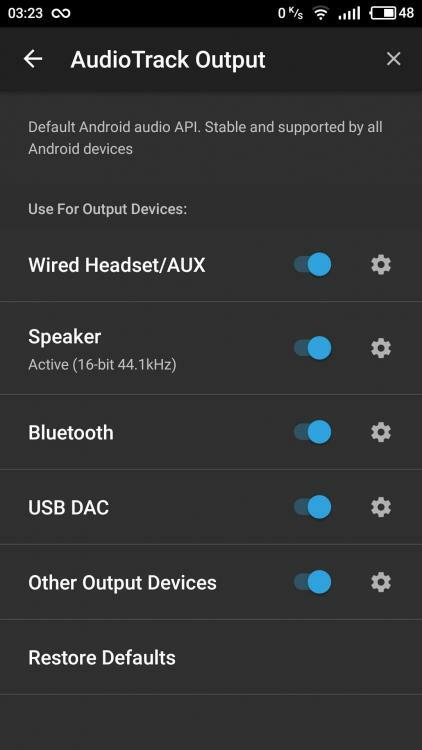 I install Poweramp in other phone (Samsung Galaxy J5) who have by default OpenSL ES Output with same bug. Next try is to clean my library maybe there is a wrong file. So now you use Audiotrack output. Did you change the settings ? Does the problem persist ? 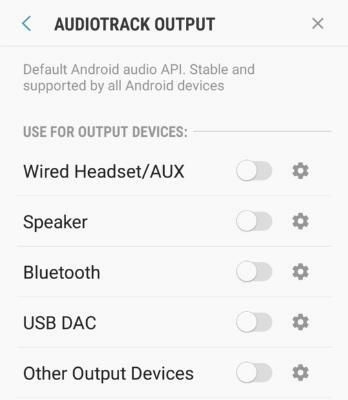 By default when I install Poweramp or reset settings it is set to Audiotrack Output not OpenSL ES Output. I try change to OpenSL ES Output. The problem persist. I did not change the advanced settings. Earlier of this video the fix is already set up. That's why I can skip without error. Second I show you "Failed to play file!" message when I un/plug aux 3.5mm. 0:55 Change output and the problem persist. At 1:40 of the video it show how I fix. But the next un/plug will get the problem back. Maybe it's a wrong/corrupt file but when the problem is fix I can play all file with no problem. Hello. I have the same problem ... I go into the player, turn on the music, plug in the headphones - the music is playing. Just change the music, as the error "Could not play the file." In this case, the music is played, but there is no possibility to rewind it. Changing audio outputs did not help. Turning off the Sound Enhancement also failed. Smartphone: Xiaomi Redmi Note 4. Android 7. Miui Global Stable 10.2.3. Immediately I found the problem on 4pda (https://4pda.ru/forum/index.php?showtopic=194117&view=findpost&p=80384472) Symptoms are one-on-one. Здравствуйте. У меня такая же проблема... Захожу в плеер, включаю музыку, подключаю наушники - музыка играет. Стоит только сменить музыку, как вылезает ошибка "Не смог воспроизвести файл". При этом музыка проигрывается, однако нет возможности перемотать её. Смена аудио выходов не помогла. Отключение Улучшения звука наушников в системе miui также не дала результата. Смартфон: Xiaomi Redmi Note 4. Android 7. Miui Global Stable 10.2.3. Схожую проблему нашёл на 4pda: ( https://4pda.ru/forum/index.php?showtopic=194117&view=findpost&p=80384472 ) Симптомы один в один. Are the files that are being skipped regular MP3 files? Didn't think so (it would always happen with same files otherwise) but I thought I'd check. Didn't﻿ think so (it would always happen with same files otherwise) but I thought I'd check. Headphones are connected, I launch the player, the music plays and switches without problems. It is necessary to turn off the headphones, switch the track and there is an error. Similarly, if the speaker originally worked. 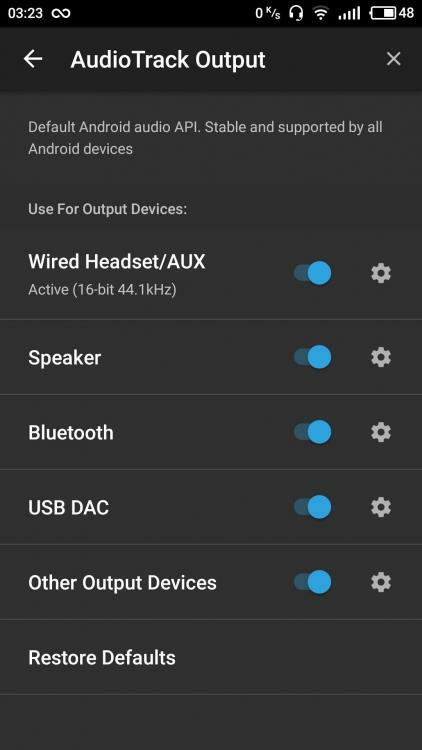 With headphones, an error pops up when switching. In my case, the problem was solved by installing a trial version of Google Play. I bought the full version, everything is ok.